When you talk about the United Kingdom, beaches are often the last thing that will come to mind because quite frankly, the UK isn’t known for great beaches. However, there is one beach that was able to surpass Spain, Greece, and Portugal. This beach is no other than Rhossili Beach. Rhossili Beach is also known as Rhossili Bay which is found in the northern part of Rhossili or the southwestern part of the Gower Peninsula. Just less than 200 meters from this place is Rhossili Down which is the highest point in the Peninsula. 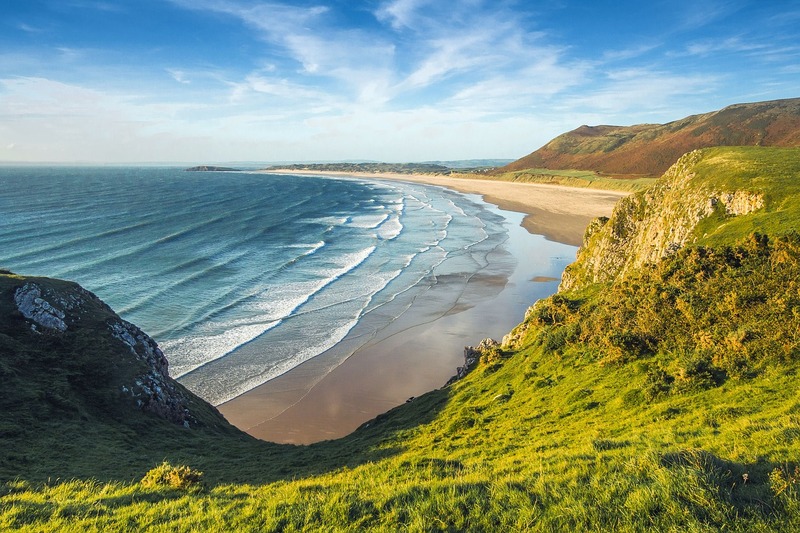 Like Rhossili Bay, this tourist attraction is famous for being a stand-out among tourist spots in the area. Long stretches of sand can be boring, but Rhossili Beach is an exception. Thanks to the slopes in the sand, it is considered to have sand dunes. Because of this, locals gave the beach a new name – Llangennith. Moreover, if you will find the Rhossili Down at the back of the beach, you will also find great features of the bay at the north and south ends. At the north side of the Rhossili Beach is the Burry Holms. This tidal island can be seen at low tide and is a great place to collect seashells. During the spring, the island shows off its beautiful flowers that make it a must-see for photographers. On the other end of the bay is the Worm’s Head. Like the Burry Holms, the Worm’s Head can also be visited during low tide. This place is often visited with caution because aside from the tides, a lot of birds nest here during the months between March and August. The north and south ends of the Rhossili Beach are not just a must-see because of the tides. They are also where you can see shipwrecks like the Helvetia. To be able to get to the beach’s facilities, you have to walk a steep path. These facilities include public bathrooms, shops, pubs, and restaurants. However, do not expect the place to be filled with establishments as the beach is less commercialized compared to the other beaches around the world. Unlike your typical beach filled with sun, swimming activities, and food stalls, Rhossili Beach offers a very different beach experience. Instead of roaming around on bikinis, Rhossili Beach is often a surfing area for beginners and professionals alike. The waves here are great for learning. Swimming can also be done on this beach, however, because there is a lack of lifeguards, tourists are requested to stay close to the shore. You can also opt to just sit on the shore or walk around and take photos of the seagulls that pass and land on the sand. If you’re lucky, you can even witness a grey seal. Just a few minutes from Rhossili is the Fall Bay. Fall Bay is one of the most uninhabited beaches as public beaches can get. This is because its location is hard to go to that tourists don’t bother visiting. However, if you do have the patience and the curiosity to find out what makes Fall Bay a wonderful place to discover, then you’ll find that this is the perfect spot to unwind because of its remoteness.